HCM CITY (VNS) — Provinces in the Cuu Long (Mekong) Delta have strengthened measures to control drought and saline intrusion, including dredging canals and closing sluice gates, as thousands of hectares of rice and coastal locals are facing a water shortage. Truong Van Phuong, deputy head of the Bac Lieu Province Sub-department of Irrigation, said the province had to pump water into rice fields and dredge canals to take water. Saline intrusion occurred earlier than expected this year and was more severe than in previous years. By mid-March, many canals in Bac Lieu's Gia Rai District had dried up while rice fields were in bloom, a crucial stage of growth when they need more water. Drought has damaged about 30 per cent of 200ha of rice fields in Gia Rai District, according to the district's Agriculture and Rural Development. Pham Thi Dung, who had planned to harvest 6ha of rice in Gia Rai's Phong Tan Commune, said her family would have a bad harvest this crop as her rice field lacked water. "My rice yield will likely be 70 per cent less than expected," she said. In Tien Giang Province, residents in Loi Quan Islet on the Tien River in Tan Phu Dong District have faced a shortage of fresh water for daily use since last month. Truong Huu Quan in Tan Phu Dong's Tan Thanh Commune said ponds and lakes in his area had dried up. "My family has to buy water for daily use," he said. Nguyen Thien Phap, head of the Tien Giang Sub-department of Irrigation, said the saline intrusion had occurred in the entire area of Tan Phu Dong. Tien Giang has used barges to transport fresh water from Chau Thanh District to Tan Phu Dong. The transport will continue to the month-end and cost about VND1 billion (US$47,000). On the Tien River, saline intrusion with salt content two times higher than the same period last year reached Tien Giang's My Tho City, 65 km from the river mouth, according to the Southern Irrigation Science Institute. The institutes said the peak for drought in the delta would occur this month. In Soc Trang Province, local authorities planned to grow only 38,000ha of the spring-summer rice crop, but farmers have sowed 57,000ha. The Soc Trang Province Sub-department of Irrigation is monitoring river tides to pump fresh water for storing in canals. However, fresh water is rare this month, so the Soc Trang Province Sub-department of Irrigation has proposed to mix water with a salt content of less than 0.15 per cent with water left in rice fields to ensure water for rice cultivation. Lam Van Vu, deputy head of the Long Phu District Agriculture and Rural Development in Soc Trang, said the salt content of water in rivers had increased in recent days. Long Phu had closed sluice gates at rivers to prevent saline intrusion, he said. Farmers had been urged to speed up harvesting their rice soon to reduce damage caused by saline intrusion. Long Phu had harvested more than 5,000ha of its 13,000ha of rice, he said. In Hau Giang Province, about 30,000 ha of rice are at risk of damage because of drought and saline intrusion. Hau Giang farmers have sowed more than 40,000ha of summer-autumn rice. The province plans to grow 75,000ha of summer-autumn rice this year. 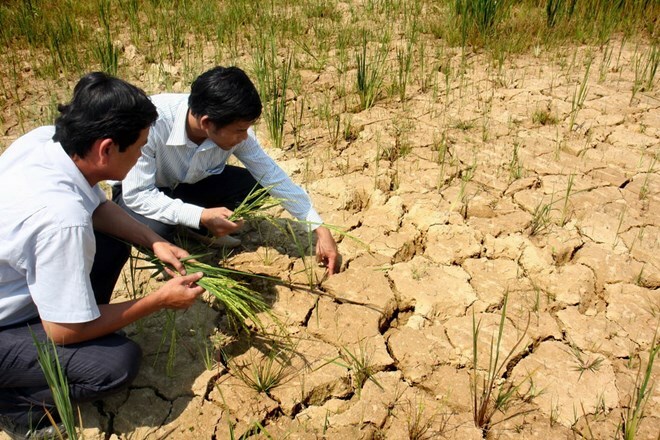 Nguyen Van Dong, director of the Hau Giang Province Department of Agriculture and Rural Development, said drought and saline-intrusion prevention measures had been taken in all communes. The province has closed all sluice gates to prevent saline intrusion. "The weather is complicated this year, so Hau Giang has actively taken many measures to ensure production," Dong said.